Workflow is the process that takes over after a form submission; There are other times, but after submission is the most common. Examples of workflow include sending an email to confirm a submission, creating change records for your CAB, or generating approvals for hardware purchases. 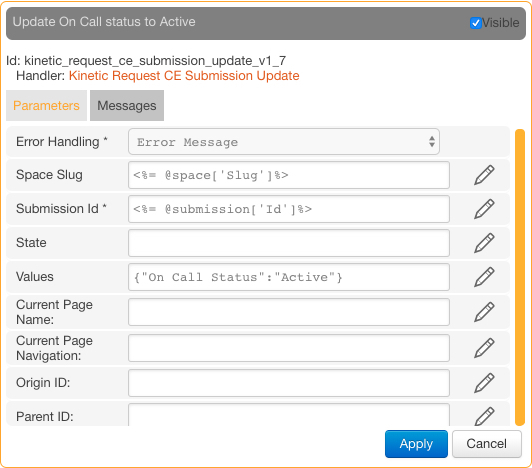 You create workflow in the Kinetic Task part of the platform. Kinetic Task comes with a powerful visual workflow designer to help you create your own customized workflows. The visual workflow builder within Task is a powerfully simple tool. Community includes links to hundreds of pre-built Tasks that you can start using right away, or use as the basis for your own custom Handlers. Nodes and Connectors are the elements that make up workflows. Each node represents a specific task (also called a Handler) for a specific workflow. Depending on the construction of the task, you'll have different inputs and results from each as the workflow processes. Below is an example node that allows you to update a submission. In this case it's updating a field to a status of active. Results of nodes are easy to use in other nodes in your workflow. They are referenced from drop-down lists in the parameter fields. A deferral is a part of a workflow (a node) that has paused and is waiting for an outside action to send a signal to the Task Engine that that workflow needs to restart. The classic example of a deferral is an approval. The original workflow is paused while an approvers decides if it should proceed or stop. Of course, you can also pass information back to the workflow so it can make informed decisions about how to continue processing. Back to the approval example, you want to pass the decision of the approver, and any notes about that decision.